Since returning from vacation, I’ve already visited my local farmers’ market in Lancaster twice. I have stocked up on fresh summer veggies and have been having some amazing salads and pasta dishes. I wanted to tell you about a farmers’ market that Janeen and I discovered in California that you must not miss if you are driving on the west coast. After our adventure in Morro Bay, we drive back inland to San Luis Obispo for the Farmers’ Market that was advertised to happen ever Thursday night from 5-9pm. 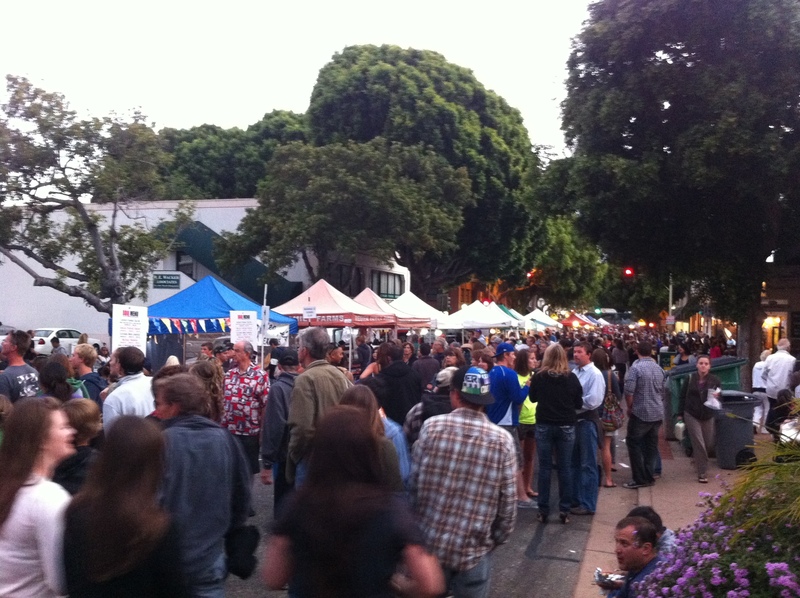 We did not know what we were in for… this farmers’ market was epic! It happens every week… I couldn’t believe it. 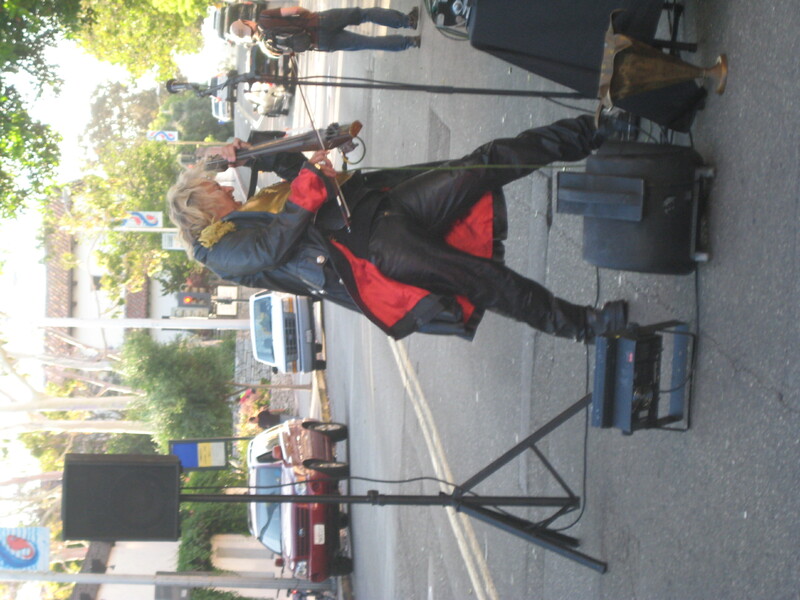 It was five blocks long – they shut down five blocks and the side streets in the busiest part of town for the whole evening! We got lemonades from F. McLintocks. There was a line that stretched well past the block where their barbecue stand stood. I wanted to see if it was really worth it but I was starving and not sure if I could wait an hour for food. They do have a restaurant right there that is open as well, so you could try their food anytime. I think the barbecue might be a special for the farmers’ market because they were smoking it right there on the street. Luckily, the lemonade was in the express line. 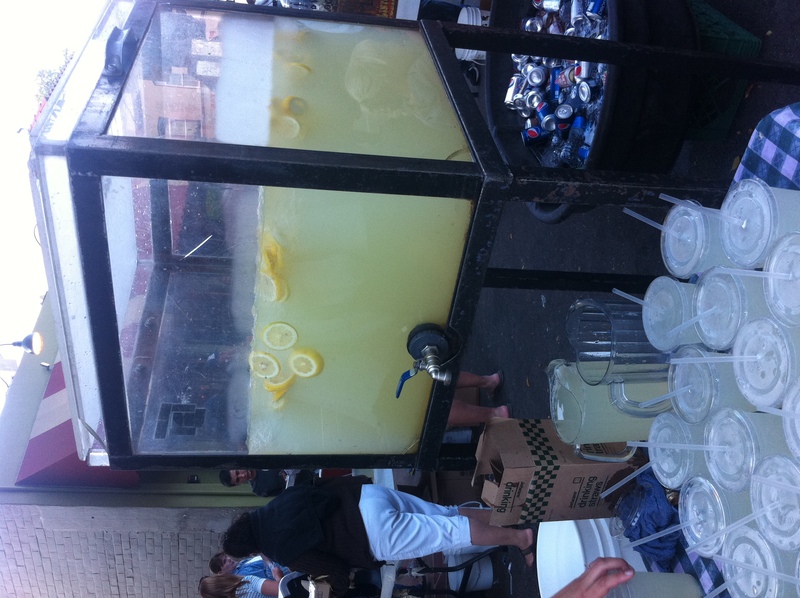 Check out the giant specialty-built box they use to contain the lemonade. 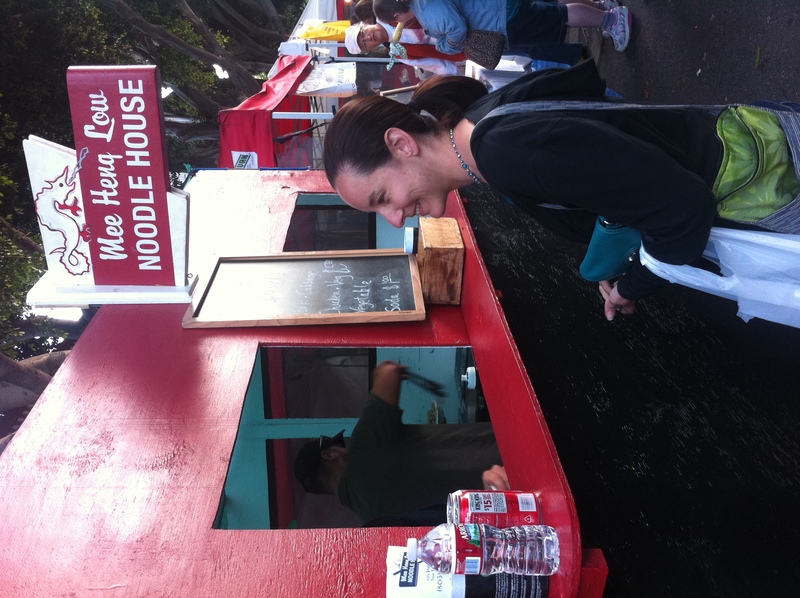 We decided to try the noodle bowls from Mee Heng Low Noodle House. I have had this hunger for some kind of noodles the whole time I was in LA, so I think that’s why I gravitated towards this choice. The name was pretty funny too… I didn’t really notice until the second time we walked by. I got the chicken and veggie. 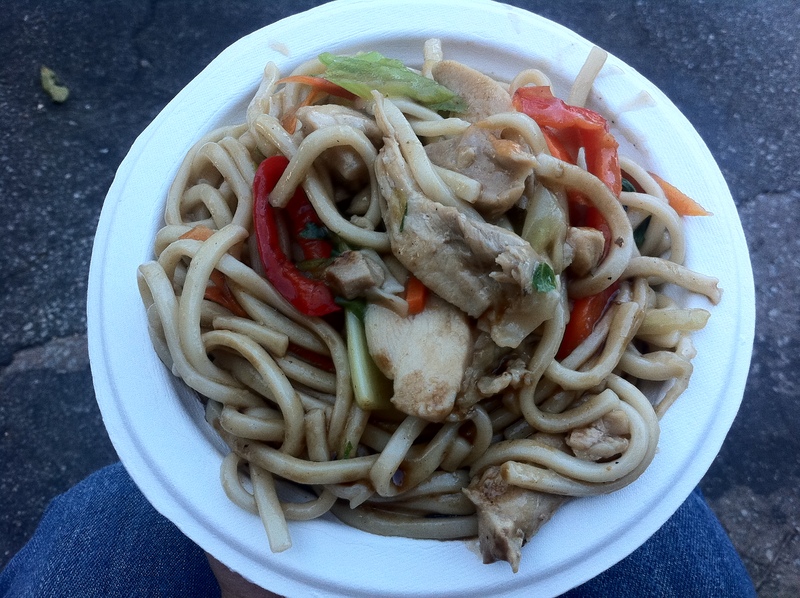 It had cabbage, red peppers, scallions, carrots and mushrooms all mixed up in noodles similar to Udon noodles. There was a thin brown sauce coating everything. I thought it was good, but not awesome. It definitely satisfied me but it didn’t really stand out as something special. I think I might be able to do better at home, I think that my bowl just had way too much sauce because it pooled down on the bottom. Next time, I am going to stand in line at the barbecue place, or the Korean barbecue place.. It was retro and oh-so-cool! The silver funnel held the batter and dispensed it in perfectly shaped mini doughnut rings. They took a float in the long fryer and this little scooper flipped them over half way down the line. If you look at the picture above, you’ll see half of the little doughnuts look cooked and the other half look very light colored – that’s right before they get flipped over. 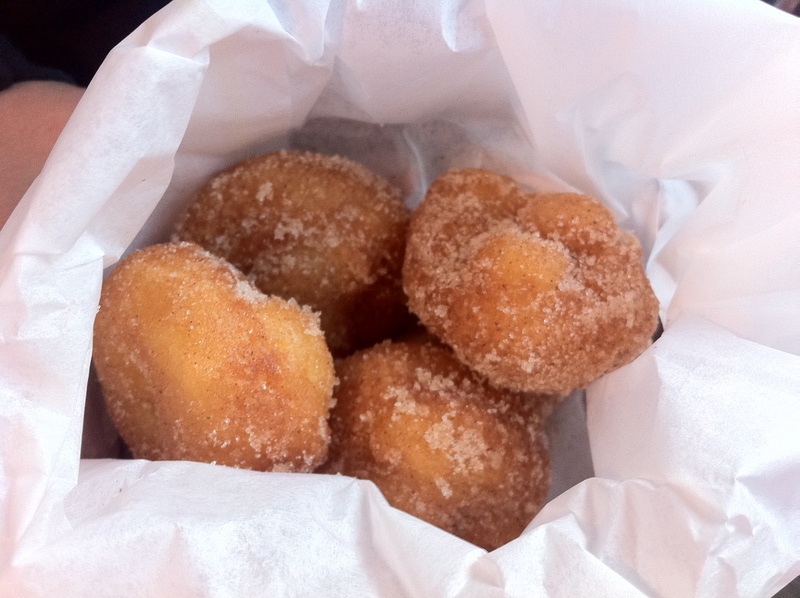 The doughnuts are dumped in the pan at the end and then coated with sugar. And they are oh-so-awesome! 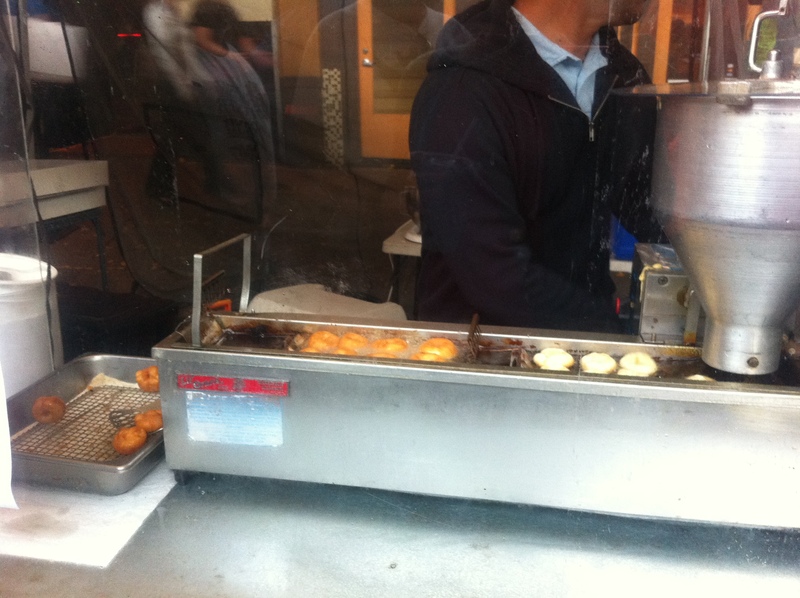 A delicious treat… I would love to own one of these mini-doughnut makers. What a fun thing to have for a party. I guess they got started with a mini doughnut truck in Denver, Colorado and now have a spot in California. It’s a great idea, the doughnuts are great street food. There was a really nice park with a creek and pretty flowers right behind the street where the farmer’s market is located. The restaurants all had decks and outside seating along the creek. It was a very nice spot to hang out and have a drink. The temperature outside was cool and refreshing. 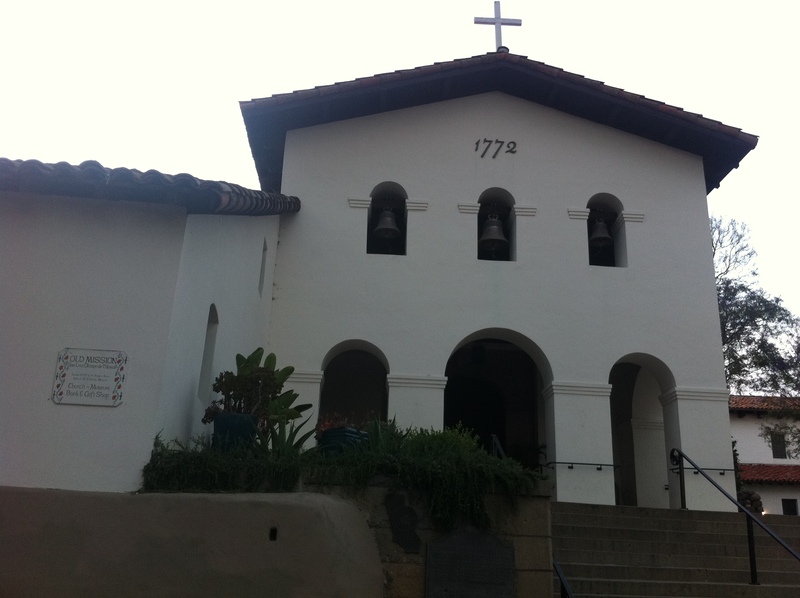 Right across from that was the old mission of San Luis Obispo. 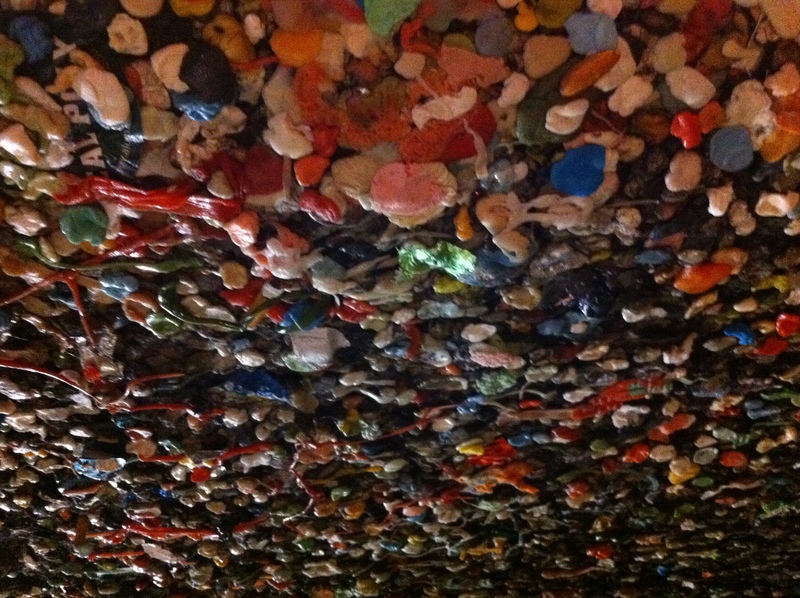 Right before we ended our walk around town we remembered a touristy attraction that we read about and wanted to have a look for ourselves at the weirdness that is called Bubble Gum Alley. 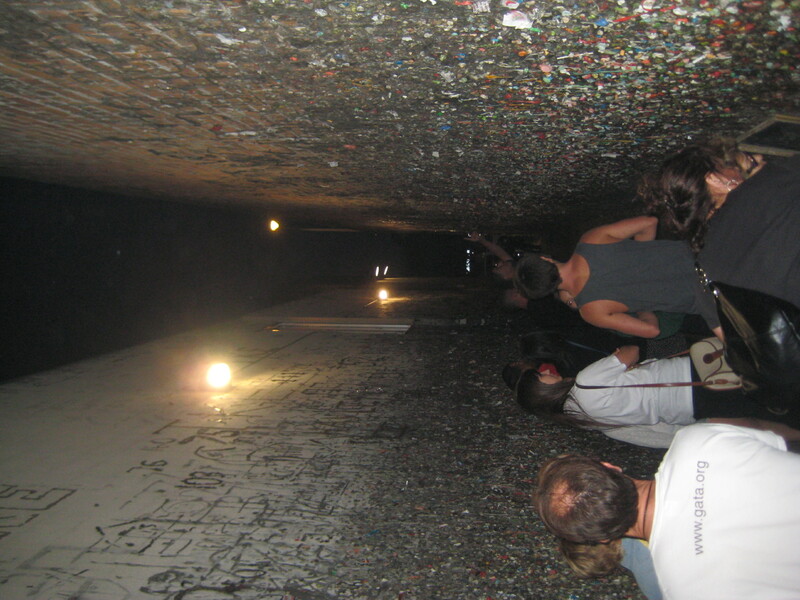 People have been sticking their chewed up gum all over this little alley’s walls for over forty years! I didn’t think I would be grossed out by this but it was pretty disgusting. I definitely did not want to touch it.